Legislation requires all rented property to have a legionella risk assessment undertaken. 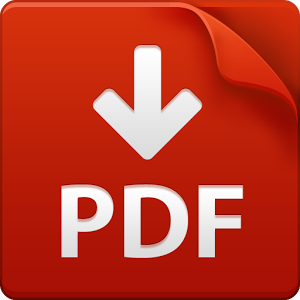 Following the recent controversy over what you need to do,Victor Michael have obtained clarification from the HSE, UK Association of Letting Agents and RICS as to what your responsibilities are. Last year the HSE produced a revised simplified version of the Approved Code of Practice (ACOP) “Legionnaires” disease: The control of bacteria in water systems L8’. However, while the ACOP was updated, it didn’t change or alter the responsibilities placed on Landlords in any way. The law has not changed. The simple fact is that landlords, who provide residential accommodation, have a legal duty to ensure the risk of exposure to tenants to Legionella is assessed and controlled. However, in most residential properties where smaller domestic-type water systems are installed and there is regular water usage, a simple assessment may show there are no real risks from Legionella. This can be carried out as part of a mandatory visit such as gas safety check or general maintenance. It should be possible for a landlord to assess the risk themselves but, if the Landlords are not comfortable doing so or not able to attend the property in person, they may instruct their agent to take care of the matter or arrange an assessment with a specialist supplier if necessary. If you answered yes to any of the above your, property could be at risk and would need further assessment. 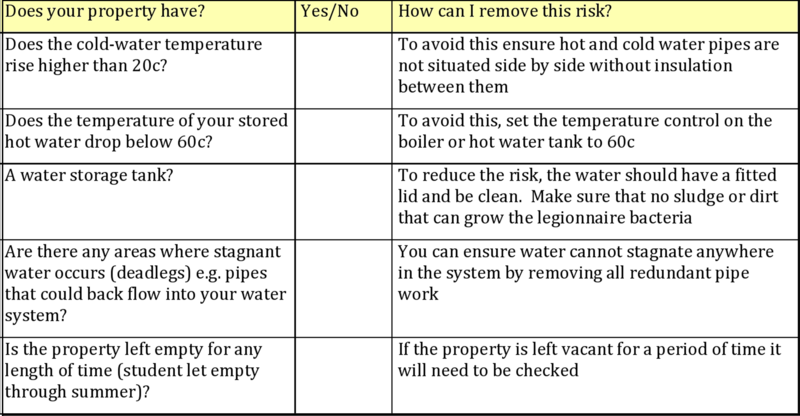 If you answered No to all of the above questions there is a low risk of your property and provided that you advise your tenants of the risk of Legionnaires disease and give a few simple instructions to them, the risk will remain low and no professional assessment will be required as long as the above items are managed. To regularly run water through any sinks, baths or shower and flush toilets if they are not been used on a regular basis. “Landlords are required to undertake a simple assessment of the risk which may show that there are no real risks from Legionella and that the risks are being properly managed. In most cases, no further action is required because the risks from hot and cold water systems in most residential properties are generally considered to be low due to regular water usage and turnover. Implementing simple, proportionate and appropriate control measures, such as cleaning showerheads, setting the thermostat to 60°Cto deliver hot water at 50°C to outlets, will ensure the risk remain slow. Installation of combi-boilers lowers the risk further as there is no water storage. http://www.hse.gov.uk/legionnaires/faqs.htm- As a landlord, what are my duties? As the "property information people" we believe it's our duty of care to keep you informed about the latest changes in the UK property law. Every month we sent newsletters and updates on changes and new legislations added that impacts the way we service our landlords, tenants and business partners. Whether you are looking to buy, rent, sell or invest in a property, speak to us first. The rules and regulation changes and updates can often be very confusing and are implemented at such short notice it can be hard to keep up. It's our job to know what is it and how it might affect you. Feel free to read through our website where you will find the latest news and views. Call our property management team today on 020 8522 5909 for more information and sign up to our weekly newsletters to stay up-to-date. We have invested a huge amount of time and money in staff training this year to make sure we are leading the way with industry legislation. We feel this sets us apart from our competitors and pride ourselves on the knowledge base within the company.